Recently, I am learning to have fun with my art and treat it as play. To embrace the ambiguity; let the paintbrush reveal it's secret in it's own time. I am reminded that I'm a future thinker, future oriented. That is I plan ahead, I envision what could be and it's hard to snap back to the reality of now. Now isn't there yet, there that happy place where my dreams are. There is still doing to be done before what could be, becomes what is. I get frustrated at not being where I want to be, so I am learning to embrace the unknown; the now and all that zen. It's like Lord, why can't I have it now?! I know, I know, it's about trust, learn to have faith in Your plan and to let it happen in Your time. I need to surrender my control over everything. So I'm learning patience too. To do the doing and take each.step.one.at.a.time. I still get to make lists & plan ahead (yay!) but not so far ahead that it overwhelms me with the bigness of it all. i wonder what this will be..."
I'm fully aware that I procrastinate in order to avoid the present in order to indulge in daydreams of the future (or past.). That's why I try to do something 'productive' and involve some creative practice in my procrastination too. (I say that now, though sometimes I will just eat chocolate and indulge in traveling down the wormhole that is the millions of amazing articles online. Or daytime tv.) Knowing I have these tendencies means I can work with them, indulge in a little postponed productivity but still develop my creative practice (my goal). This only comes from lotsa contemplation & self-observation. 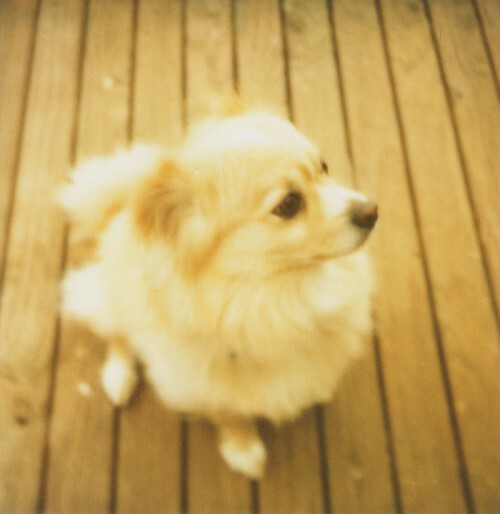 So I bring out my polaroid cameras, and try to take 'arty' photos instead of just photos of Jelly. Being such an expensive medium, it does limit my mindlessness and force a little thinking in composition and creativity. Learning to find the beauty & sacredness in the everyday around me. All good things to have for the practice of seeing. Afterall, art or drawing or painting is all a way to see the world right? I've updated my redbubble site with those recent polaroids. (See I was a little productive!) Photos seem so easy sometimes, point & click then upload. While painting seems to take it's sweet time to reveal itself. I feel a little sad I don't have finished pieces to show. All part of the story that is yet to unfold I guess. These were plucked fresh from my garden. Jelly knows the drill. Pose properly and it will be over faster = more play time. They remind me of The Wizard of Oz. Walking on an adventure somewhere. What have you been learning lately about yourself? p.s Did you enjoy this post? If you did, please use the buttons below to share the joy! Check out my redbubble site and help spread the love about my art. It'll totally make my day! p.p.s While you're at it, you might also like to sign up by email to receive free updates in your inbox or subscribe to my RSS feedThanks muchly for your support! MORNING MOMENT: A SELECTION OF LIFE DRAWINGS.